Much progress has been made on the nEXT Generation project, UW-Extension Cooperative Extension’s two-year effort to reimagine its structure and educational delivery to best serve current and future audiences, while addressing a $3.6 million structural budget deficit. Earlier this year, plans were finalized for the restructuring of county, campus and administrative organizations. These plans are now being implemented. This eCALS article summarizes Cooperative Extension’s key organizational changes. A second eCALS post on nEXT Gen, which will run next week, will focus on how nEXT Gen changes will affect CALS. For a big-picture look at Cooperative Extension’s new organizational structure, view the new Cooperative Extension Organizational Chart. It’s easy to see some of the key changes: a new structure for geographic administration, as well as a new structure for programmatic/academic administration. Cooperative Extension used to have four Program Areas: Agriculture & Nature Resource Extension (ANRE); Community, Natural Resource & Economic Development (CNRED); Family Living Programs (FLP); and 4-H Youth Development (4-H YD). CALS faculty and staff were in every former program area except 4-H Youth Development. Now Cooperative Extension has two departments to oversee programmatic and academic functions. The departments are divided into institutes, which are further organized into centers and programs. Department of Agriculture and Natural Resources. This department combines the ANRE program area, the CNRED’s natural resources programs, and the Wisconsin Geological & Natural History Survey. The department is divided into two institutes: The Agriculture Institute, which houses agriculture-related centers and programs such as the Center for Crops & Soils; and the Natural Resources Institute, which oversees natural resources-related centers and programs such as the Center for Water Resources. The department is led by Associate Dean Patrick Robinson. Department of Youth, Family and Community Development. This department combines the FLP and 4-H YD program areas, as well as CNRED’s community, economic, organizational and leadership development programs. It has three institutes: Communities Institute, Youth and Family Institute and the Health and Well-Being Institute, which house their respective centers and programs, including 4-H. The department is led by interim associate dean JulieAnn Stawicki. All programmatic faculty and staff across Cooperative Extension, including those based on UW Campuses, will be affiliated with one of these two departments. As in the past, faculty governance will be organized through Cooperative Extension academic departments that mirror programmatic departments and adhere to the UW-Extension Articles of Faculty Governance. In order to streamline administrative tasks and increase efficiency and efficacy, Cooperative Extension has restructured administrative leadership across the state’s 72 counties. 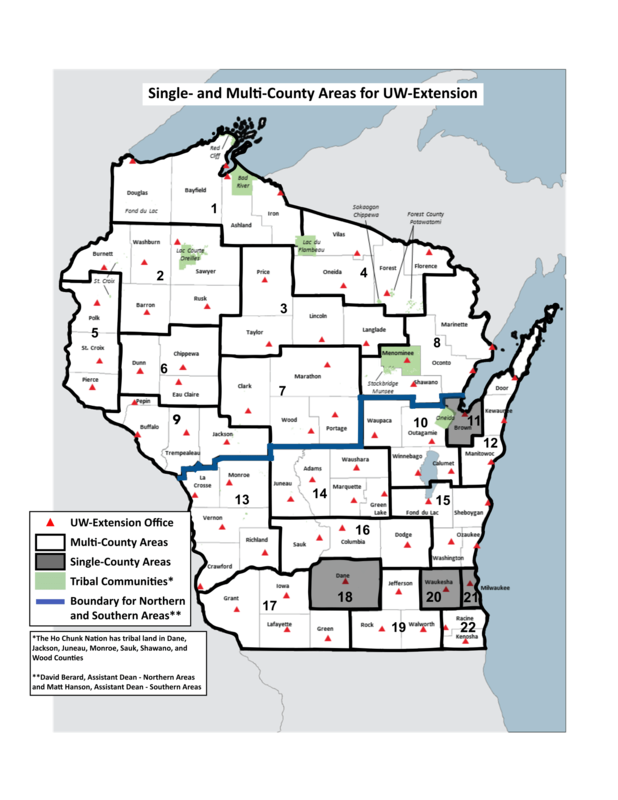 Under the new geographic administration structure, the state is divided up into 22 single- and multi-county areas. Each area has an Area Extension Director responsible for managing relationships with county governments and county-based staff; hiring county-based staff for their area; coordinating programming efforts in their area; and more. Two Assistant Deans are responsible for leading and managing the Area Extension Directors. David Berard is the Assistant Dean of the North Zone and Matt Hanson is the Assistant Dean of the South Zone. Other decisions related to the structure and staffing for county offices include maintaining an Extension Office in every county that’s willing to commit to continued funding and space for Cooperative Extension staff. Cooperative Extension will also create new statewide outreach and research positions—called Extension Specialists and Outreach Programmers—that may be based in county offices, tribes, UW Campuses or Extension centers, but will serve broad audiences based on local, regional and statewide needs. Cooperative Extension will continue to invest in UW campus-based positions, in addition to these new regional positions. Area Extension Directors will help coordinate the connections between campus-based positions and county-based and regional positions. For more information, visit the nEXT Gen blog. This entry was posted in Highlights by Ben. Bookmark the permalink.